Seriously, I just want to LEAVE the country! So there is something that really bugs me in the international airports here in Brazil. No, it's not the fact that my baggage clearly takes a scenic tour on the way to baggage claim (I will have to eat my words this time when it arrived in 10 minutes as opposed to the 45 minutes the time before). It is not the two hour line at immigration at arrivals (depending on the day, and now that I am a permanent resident, it's much better). No, it's the emigration line. When you are leaving Brazil on an international trip, you have to go through immigration after the security lines. Note: security here is a breeze next to the US. Not scary breezy but nice breezy. Keep your shoes on, keep your computer in and come on through. But immigration can often back up to the security lines. When I left last Sunday, they stopped security several times so that they could clear the immigration lines. Yes, you have to go through whether you are Brazilian or non-Brazilian. If you are traveling without your partner but with your kids, you are in big doo-doo. That takes forever. You must carry a notarized letter that says you are authorized to travel without your partner--all of this to prevent international kidnapping. So, I'm in favor of checking out the unaccompanied travel of minors. But I am completely opposed to sending everyone through immigration. So, inevitably, I have to compare with the USA. When you leave the country as a citizen, you go through security (stripping down to your grundies, getting blown by some puffer machine or arms in the air with some kind of ultrasound, or whatever) and then you go to your plane. Done. If you are a non-citizen, you used to have to carry around the little I-94 coupon and the airline would take it, but I didn't see that this time with the BH. BH is not a citizen or a permanent resident of the star-spangled country but went through at the same velocity as I did. Why is it like this in the US? Probably because the NSA is scrutinizing you from the second you book your ticket. There are no surprises about who is leaving the country and when because the NSA and TSA and possibly Obama knows which seat you're in and what you're having for dinner and which movies you watched on the plane (yikes, that last Nemo is not reflecting well on me). Why can't we do this here? Why do I have to wait in an hour-long line to get through immigration to LEAVE the country? You're getting rid of me so who cares about checking the passport? Or we can do the same as the UK which I loved last time in Heathrow. The immigration guys randomly pulled people out of line at the gate. They checked your passport and visa and asked a thousand questions, did a cavity search and you were on your way. Also, the really bad guys are not going to go through Guarulhos or immigration at all. Like Pizzolato, the guy condemned in the Mensalão trial, goes by putt-putt plane, raft, crocodile back, whatever to Argentina and Paraguay, uses his dead brother's passport and he's out of here. This immigration stuff is just not working. Also it's "emigration", no? Now I admit to cheating on Sunday. Instead of waiting in the Brazil/permanent residents line which was 4000000000 people long, I went to the foreigners line which was 10 people long. I pretended not to speak Portuguese. I am bad. But I got out of that line in 20 minutes instead of an hour or more. You do what you have to do. Let's get this together before the World Cup, okay Brazil? Gringos don't like missing flights because of immigration. It makes them cranky. Ditto Brazilians by the way, but they don't have the luxury of jumping lines. 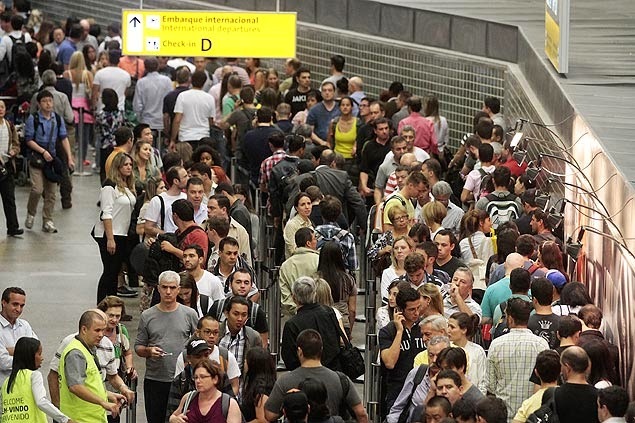 Here's the story on the weekend mess at Guarulhos International Airport. Bon Voyage!
" I tried to post on the blog but it wouldn't let me for some reason, so here we go: What you are calling the "Emigration" line or "Immigration" line we actually call THE FEDERAL POLICE LINE, or simply Policia Federal, which is a rancid reminder from the days of Brazil's 30 years of dictatorship. You couldn't just leave the country without the military dictator's checking who you were first, you know, like the NSA does to us in the present day. A lot of (so called terrorists=anyone fighting the regime) people tried to leave the country after fighting against the military and they were placed on a "Black list" of the ones not authorized to leave and having to face the ( torture ) consequences. Nowadays, they mostly check if you are wanted by police for some criminal offense before leaving the country, mostly because Brazil doesn't sign or respect any extradition treaties, so they have/like to keep their bandits around here, before having to go begging for some other country to return them when Brazil never returns their bandits! And yes, we get caught in this nasty mess!" Hi, thanks for helping me post this comment. Yes, unfortunately, a lot of crazy stuff that happens in Brazil today, are a sad inheritance from our 30 odd years of dictatorship that we had in this country. Hope I was able to help clarify this one.